If you need to read this, shame on you – you weren’t there! 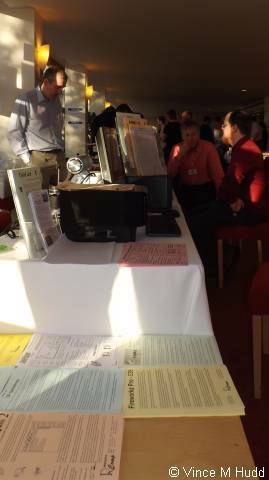 The 2014 London Show took place two and a half weeks ago, on 25th October, at the St Giles Hotel, Feltham – and, with the trusty RISCOSitory coin suggesting anti-clockwise as the direction to take, here’s a rundown of who was there and what they’d brought along. After paying a modest entry fee – and thus helping to ensure the show remains viable and will be held again in future – your first port of call would be Michael Emerton’s RiscDJ stand. 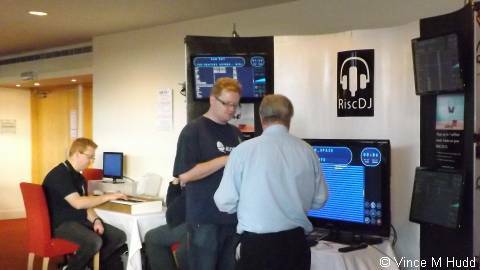 Michael, as ever, put everyone else to shame with a high quality display on which four monitors were mounted, along with a larger one on his table – all showing a different copy of RiscDJ in action. 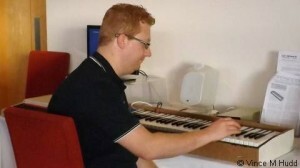 The software allows you to organise your collection of music files, and offers both ‘destructive’ and ‘negative’ search facilities – allowing you to only see tracks that were found by the search term, or exclude such tracks in the latter case, with Michael citing “-christmas” as an example of an invaluable negative search term. 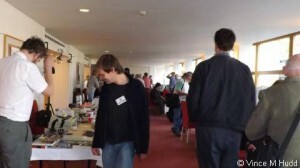 The next stand should have been manned by David Bradforth, representing the new tribute APDL website (honouring Dave Holden, who passed away earlier this year), as well as showing off and selling his crowdfunded book, A Potted History of Acorn Computers. David was also set to provide the show’s penultimate theatre talk but, unfortunately, was unable to make it on the day, apparently due to car trouble. The day after the show, David uploaded the cover design for the book to the crowdfunding page and, since then has issued more updates, including a statement that “we still have our print slot” – which is an interesting comment, considering that the estimated shipping date for the book was supposed to be September according to the Indiegogo campaign page, and that he was going to have it at the show. There may therefore be some (entirely understandable) concern about the status of the book amongst those who have sent funds David’s way. Keep your eyes on the campaign updates page, though, to read “alternate daily PDFs of an article from the book” and note that David has said there will be an extra provided to everybody who has contributed via the crowdfunding site, as a ‘thank you’ for being patient. With David not there, however, the stand instead played host to a CLEF CMS, which is a synthesiser system for the BBC Micro that I had never before heard of, and which (I think) was brought along by Michael Emerton’s brother, who’s name I didn’t catch. Apparently, it came in two versions – a ‘polished’ version, and one taking something more of a DIY form, with the one at the show being the latter, housed in a rough wooden case with the guts on display to the left of the keyboard. 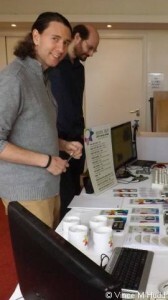 Next along was Richard Brown of Orpheus Internet, as usual offering sweets to entice people towards his stand, whereupon he could seize upon the opportunity to talk about the services offered by the most RISC OS-friendly ISP in the land. 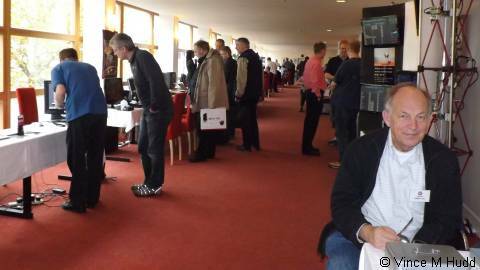 Richard is one half of the Dynamic Duo, along with R-Comp’s Andrew Rawnsley, that now organises the South West Show – and informed me at the show that the 2015 show will take place on 21st February. Immediately following Richard, on-off-on-off-under-new-management PDF magazine Drag ‘n Drop was being punted by editor Christopher Dewhurst. There were a variety of offers from Chris, including the opportunity to subscribe to the magazine, which pops out of the ether four times per year, rather than buying each issue as they are published. 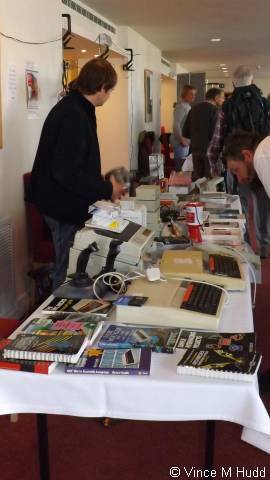 After sorting yourself out with something to read, you would then have been able to contribute to the charity stand, either by buying something, or giving them something to sell on – or even just by dropping some change into the collection tin. The charity supported at the London Show is the very worthy Combat Stress, a charity dedicated to supporting our veterans, men and women of all ages who have served Queen and country, putting their lives on the line, and who have suffered the psychological effects that can bring. This year, about £300 was raised for the charity – £287 in sales from the stand, and £13 from the collection tin. 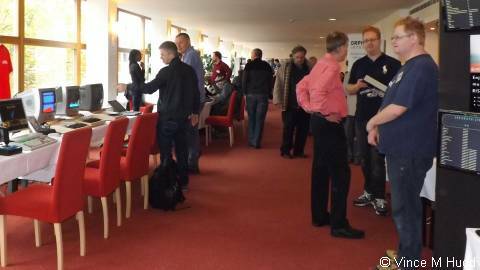 For those who have dates to remember – such as the dates of any upcoming RISC OS Shows or user group meetings – an ideal way is a piece of software designed to organise your life. 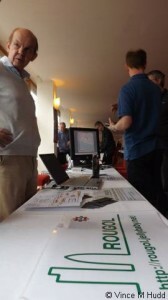 Step forward, then, Organizer, which was represented on the next stand by Nigel Willmott from North One Communications. 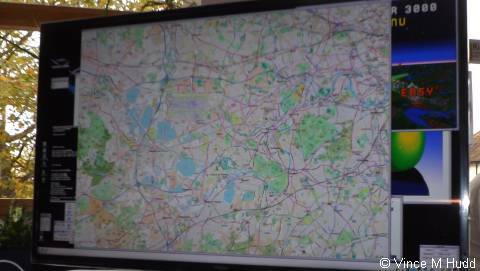 The headline feature of Organizer version 2.22, which was launched at the show, is the ability to make use of the postcode support in the latest version of Sine Nomine’s mapping software, RiscOSM – with both installed, a shift-Adjust-click on an address with a known postcode in Organizer will result in that location being shown on a map in RiscOSM. 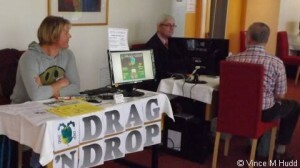 Next to Nigel, Richard Keefe was not only talking about Impression-X, but also selling beta copies. 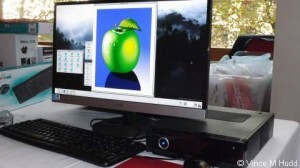 Impression-X is the name given to the 32-bit version of Impression, the popular desktop publisher that was originally developed and sold by Computer Concepts and acquired in 2003 by X-Ample Technology, who planned to make the software 32-bit compatible. Richard took on the task more recently, and says the software is now “45% 32-bit” and therefore still requires Aemulor to run on modern systems, but by selling beta versions of the software – £50 buying punters four beta versions over the course of a year – he is able to fund the significant amount of effort needed to complete the task. 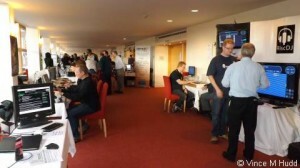 Skipping around the back of Nigel and Richard, one of the side rooms also played host to some exhibitors. 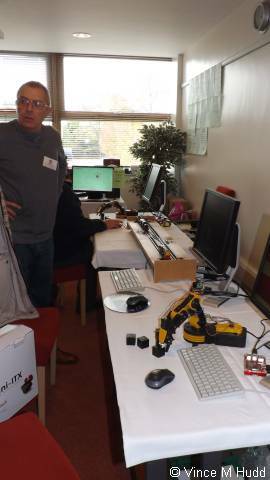 The first of these was Neil Fazakerley, who this year was inviting visitors to control a small model railway using a Raspberry Pi. 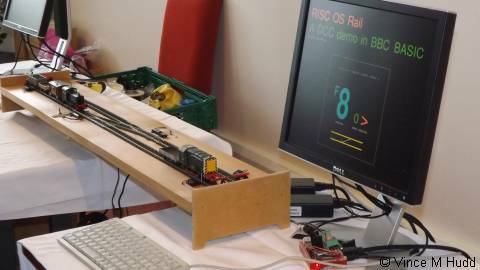 The control software is written in BBC BASIC, and works by sending information to the set up in binary form (as small electrical pulses), which either provides an instruction for the rail system itself (which for the limited set up being demonstrated meant controlling the junction) or is sent through the rails themselves to be picked up by the trains – the information contains something to identify the train, along with an instruction for that train. CJE‘s stand was next where, unsurprisingly, an impressive array of goodies had been brought along to satisfy just about every need for the show visitor – and while Andrew Conroy looked after the portable showroom, Chris Evans gave the first theatre talk of the day, with – after an overview of some of the things they had available or on show – the obvious focus of that talk being the plans he has for a laptop using the Raspberry Pi Compute module. 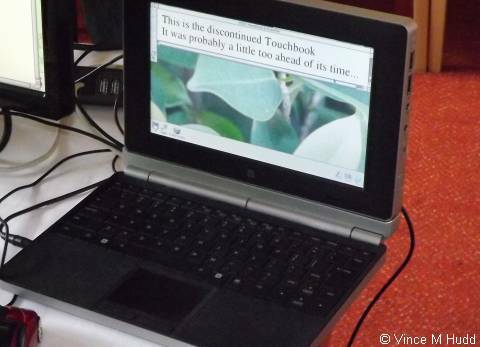 Chris spoke of the difficulties getting a laptop keyboard to work over USB, explaining that he has had software developed for a microcontroller to get around the problem – though getting the touchpad to work was still on the ‘to do’ list. As he worked through his presentation, Chris distributed flyers detailing the planned specification of the laptop part way through the talk, but didn’t go into any detail in the talk about that same specification – just touching on some aspects of it, such as the 4MB 4GB eMMC memory provided on the Compute module, and the possibility of bringing some of the GPIO pins to the outside world via the space normally occupied by an optical drive. I hope this doesn’t come across as harsh, but for sanity’s sake, Chris, please consider using the projector for your presentations when one is provided – create a slideshow. Rather than pick up the odd component, which for people at the back (or watching on YouTube) isn’t that easy to see properly, show photographs via the projector instead, and when talking about the specs, a clearly detailed list as a slide would be much better. Anyway, that aside, Chris then drew people’s attention to a heart on the flyer. This comes from the notion that the central part of a system could be considered its heart, and if a system is modular enough that that part can be replaced, that would be like giving it a heart transplant, and in this puntastic world, cases could be bodies, and Andrew Conroy – who would most likely be carrying out the task of fitting parts – could be a heart surgeon. Thankfully, the puns stopped there! On the final stand in the side room, Jim Nagel was representing Archive Magazine, the latest issue of which dropped onto people’s doormats about a week before the show. Jim was taking subscription renewals and selling optical discs containing an Archive archive – and reckons the next issue should appear within a few weeks of the show. 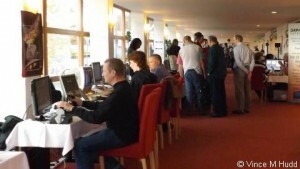 Back in the main room, RISC OS Open occupied the end of the hall, on which they had an array of modern platforms running the latest versions of RISC OS, and a selection of stuff to buy, including the micro-SD cards containing RISC OS for the Raspberry Pi model B+, and the latest version of the Desktop Development Environment – newly launched in time for the show, and including updates to the CC code generator, ObjAsm, Linker and DDT, and which has seen considerable effort made towards updating the DDE, C/C++ and Toolbox manuals up to date. RISC OS Open’s Steve Revill gave one of the theatre presentations, in which he first gave a little background information on the company – who’s involved and does what, in both official and unofficial/voluntary capacities – leading from that into recent developments, such as the new version of the DDE as mentioned above. Apparently, they have been working on version 5.22 of RISC OS, though it wasn’t ready in time for the show, and Steve said that when it’s ready it’ll be available for the Raspberry Pi, RiscPC, IyonixPC, and the Pandaboard, making it the the first version for which there has been a proper download for the latter from their website. The next exhibitor was Sine Nomine, with Matthew Phillips doing the honours for the husband and wife team. 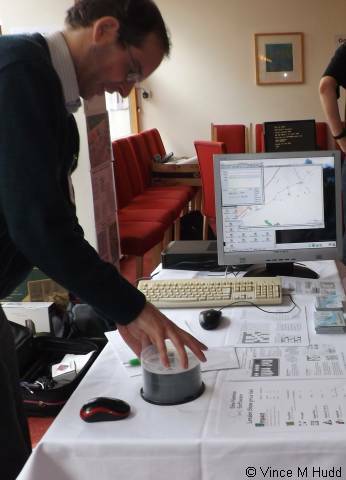 Matthew was showing off RiscOSM, the mapping software that uses modified data from the OpenStreetMap project, which was first launched at this year’s Wakefield Show – and Matthew also gave one of the show’s theatre presentations. The latest version of the software sports a few new features since the version that was shown oop North, one of which was the ability to search for postcodes – something already being used to good effect by the latest version of Organizer. The software can now also import GPX files – which are XML files produced by handheld GPS devices (and software that serves the same purpose on modern phones), and shows a route recorded by the device. Routes can also be drawn in RiscOSM, but Hilary – who developed RiscOSM in the first place – hadn’t finished that aspect as yet, so they couldn’t be saved. Another nice feature is that photographs that contain GPS data – which some modern cameras, and smartphone cameras can produce – can be dragged onto RiscOSM, and the software will use that data to open the map at the relevant location. 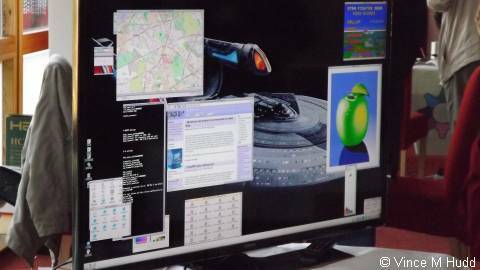 To really show off the maps, though, what’s really needed is a very high resolution screen – and that was provided by Leo White on the next stand, who had brought along a 40″ ultra high definition TV, on which he was displaying RISC OS at a stunning 3,840 x 2,160 resolution. 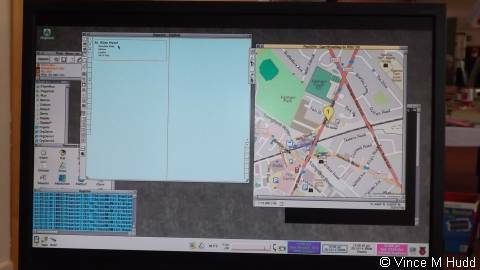 The only slight problem was that the mouse pointer would disappear when it was moved beyond the 2,047th pixel horizontally, which is probably a software problem and could therefore be resolved – but that aside, RISC OS (and RiscOSM) looked simply superb. 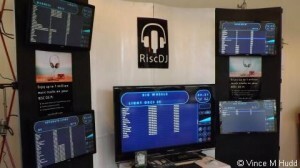 I was next, on the Soft Rock Software stand, on which I had the first batch of RiscPiC-mini cases on sale. Designed to house the Raspberry Pi models A, B and B+, the first batch are in fact only suitable for the models A and B; when a B+ is inserted, the case warps slightly, causing a corner to corner wobble – though subsequent investigation suggests it’s a combination of both the B+ and the top, so further work is needed for the B+. A prototype standard RiscPiC case was also on display, complete with badly fitting top – the reason it’s still only a prototype! 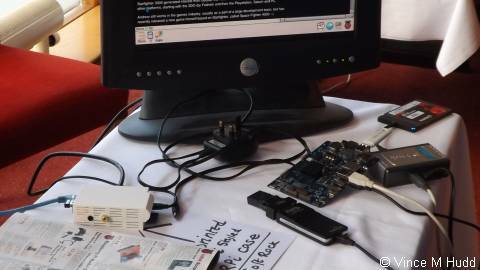 Unfortunately, although I’d brought along two Raspberry Pis (a B and a B+), when packing for the show the day before, I picked up the wrong SD card for the Model B – a card from a camera – and I don’t yet have any of my software on the B+. The actual SD card I normally use, on which WebChange et al can be found, was still sitting on the desk at home. It’s a good job, then, that I started bringing a laptop to the shows this year, running VirtualRiscPC and my old budget games – that laptop sat running Floopy all day, the game for which I have long since lost the source code, and I have now reached screen 12 (out of 40)! The system itself is described on their website as “the only embedded music production operating system in the Universe” – which is a very bold claim, so let’s hope the Flothorian Va’arns (who may or may not exist, and who may or may not also have an embedded music production operating system) don’t get wind of it and send a sueball in their direction. 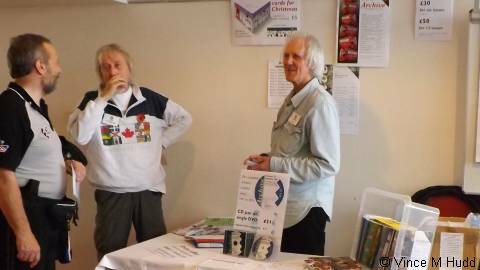 Moving on, RPCEmu was the next port of call, represented by the Howkins siblings, Peter and Matthew. RPCemu is an open source RiscPC/A7000 emulator that runs on a number of platforms. The latest version – 0.8.12 – was released a few days before the show – and the update to this version brings with it the benefit of being able to run some software that was previously incompatible, such as Photodesk. 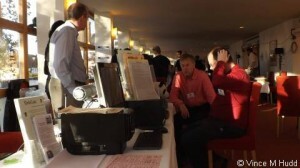 Steve Drain was immediately after RPCEmu, where he was demonstrating the latest version of Basalt, his BBC BASIC ‘Alternative Keywords’ module, which extends the language by adding new keywords and features. The latest version – 1.65, which is currently available as a beta – implements structures and other, less important features. 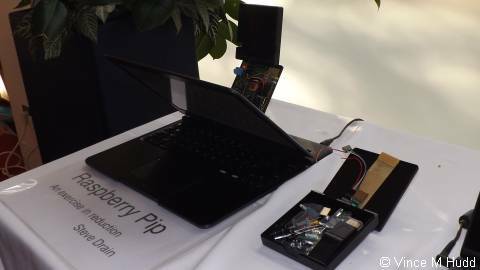 As well as talking about Basalt, Steve was also showing off the latest iteration of his Raspberry Pip – a modified Raspberry Pi in a small case, which is then attached to a Motorola Atrix Lapdock, providing a mobile RISC OS solution. Another stand featuring an impressive array of goodies was R-Comp‘s – and this year, Andrew and the gang had a very interesting new toy waiting in the wings. 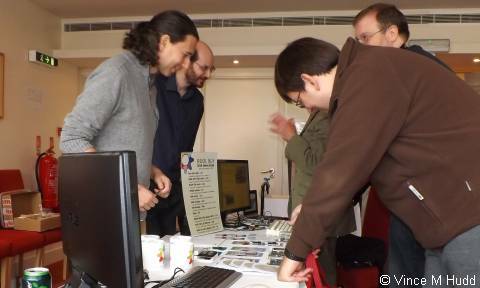 Not quite a surprise, since Andrew had been teasing people in the run up to the show with clues as to what he would be showing off, leading to speculation that it was going to be an MSX branded a machine based around the Freescale i.MX. Andrew gave one of the show’s theatre presentations, and it was during this that he made the big reveal. The talk began with the so-called ‘Golden ARMiniX’, which seems to have better display capabilities than its brethren. The computer itself was on the company’s stand. 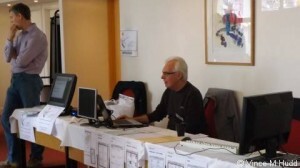 From there, Andrew moved on to a demonstration of DeleGate, version 1.00 of which was launched at the show, starting with an explanation of the reasoning behind it. DeleGate stores bins by date, and the machine had no internet/clock, so it thought it was 1970. The Recovery application tries to ensure that only acceptably named bin folders are shown “in the bin”, and regarded anything earlier than 2000 as probably “not actually a bin”. So, the files were being stored, but not shown for recovery. The simple solution was to expand the range – instructing the recovery application to show everything going back as far as 1900. The next part of the demonstration, of course, was the moment everyone had been waiting for. 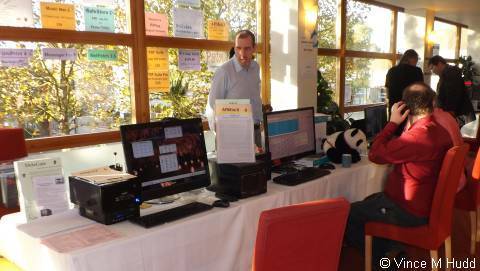 Andrew had been doing the demonstration on what people believed was an ARMiniX – R-Comp’s PandaBoard-based system – it featured their Panda ‘switcher’ icon on the right end of the icon bar – but it wasn’t. 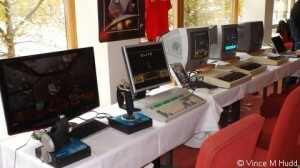 The machine was actually, as per the speculation, MSX branded based around a Freescale i.MX6 architecture. Andrew described the new system – provisionally called ARMini.MSX ARMini.MX – as a fully fledged system rather than just “a board in a box”, which neatly sums up the other new systems we’ve had over the last few years, cabable though they are. 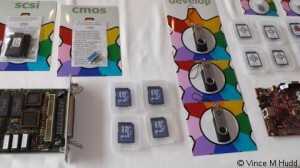 One key feature of the new system is a SATA interface, which is giving a significant increase in disc transfer speeds compared to BeagleBoard, PandaBoard and Raspberry Pi based systems, on which users must either store their data on the SD card used for booting their system, on a device connected via USB, or on something accessible across the network – and networking is another important benefit of the new system, with separate networking hardware (providing a gigabit interface). 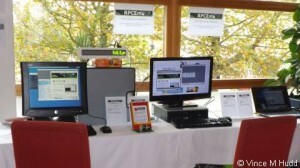 The machine has been in development for around a year, and is the result of a collaboration between several companies who, together, recognised that there is a need for RISC OS to move forward – and the new technology is already the basis of commercial products, primarily server orientated, which are already being deployed to customers who were previously using Iyonix/A7000-based systems for the purpose. The suggested official launch for the machine seems likely to be the South West Show – of which Andrew is one of the organisers – but it is hoped that “early access” machines can be delivered by Christmas – and the price is expected to be “similar” to the ARMiniX, with the possibility of an upgrade scheme from previous R-Comp machines being considered. 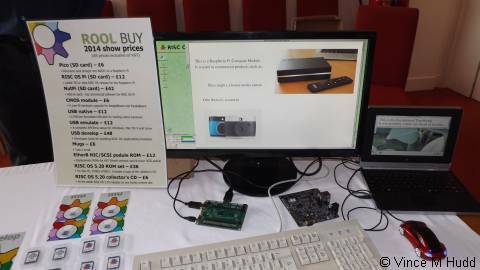 And finally, ROUGOL‘s stand also featured RISC OS running on something new – an IGEPv5 board, though it proved somewhat unstable; some programs wouldn’t work, and were subject to random crashes, there were screen redraw issues. 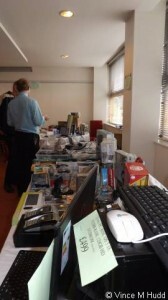 So, it’s plain to see the cunning bait and switch plan that was in play here – ROUGOL were tempting people to come and look at the new hardware and, once they’d drawn them to the stand with that, were chanting “join us…” to build up their membership. ROUGOL’s Bryan Hogan informed me that show numbers were slightly up on last year, although not by as much as might have been hoped or expected given the new releases being talked about in the run up to the show – but that it’s an increase is what counts most. Next year’s date has already been set, so stick 24th October, 2015 in your diaries – and although there was mention of a possible move, it has now been confirmed that the venue will once again be the St Giles Hotel. So that was London, 2014. All that remains is to provide a few more pictures – so there are more of mine below. 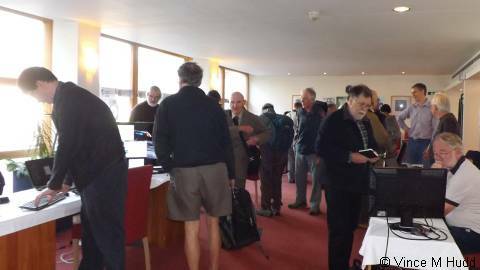 Steve Revill has also uploaded some photographs – but these may not be easily accessible from RISC OS via that link, so the individual links to each have been worked out by Chris Dewhurst.